Discussion in 'Civ4 - Fall from Heaven' started by Kael, Aug 6, 2006. It's not even october yet!!! It strikes me that many of the people who write these articles (as im recalling the last one i remember) dont actually KNOW any thing about FfH. I know they're refering to FfH 1.0, not the current 2.15 or any 2.anything. FfH2 is nigh infantely superior as well. But i suppose, that FfH 1 is most likely the coolest thing ON the warlords disk. But, then again, Firaxis did a phenominal job in creating an engine and community that has one of the most superb forms of entertainment to date. Kael and co, seem to me, to be simply "refining" that glory to a honed state of sublime tranquility. Excuse me while I enter a Zen State and have my vamipres eat a few cities. Every court has its Jester, every circus its clown. But for those who wear the motley, always a tear behind the smile rests, always a wish for the curtain to finally fall. With the freedom of inconsequentiality, Wisdom's blessings imprison him forever alone behind the veils of laughter and mirth. Awesome that it has been mentioned in a magazine article! Too bad it wasnt FfH2. Did they include FFH1 on the Warlords CD QES? That's what the article implies - I've not bought Warlords, dont plan to. FfH is why i still play Civ, and Mods do more than warlords apparently did. So, im quite happy with the communities contributions. Now, if Firaxis came out with whole new engines, and multilayered contexts, along with subsequent Civilization enhancements (more diplomatic options, better mid/late game feel. MORE early industrial and modern (1939) scenarios), i definately might. I also LOVE events. I remember when the Civ-creators came out with Fantastic Worlds. I LOVED that expansion. It was simply the most suprerior. They need to remember what they did there and repeat it, coupled with smoother "technics and plumbing" of the game. No, FfH isn't on warlords. Though there is mention of it in one of the readmes. Yeah, the article is sort of contradictory there... "superlative FfH," but the difference between fan made and firaxis made is "considerable work and obvious talent" but then they don't seem all that excited about any of the scenarios (though that may change as the review continues onto the next page.). 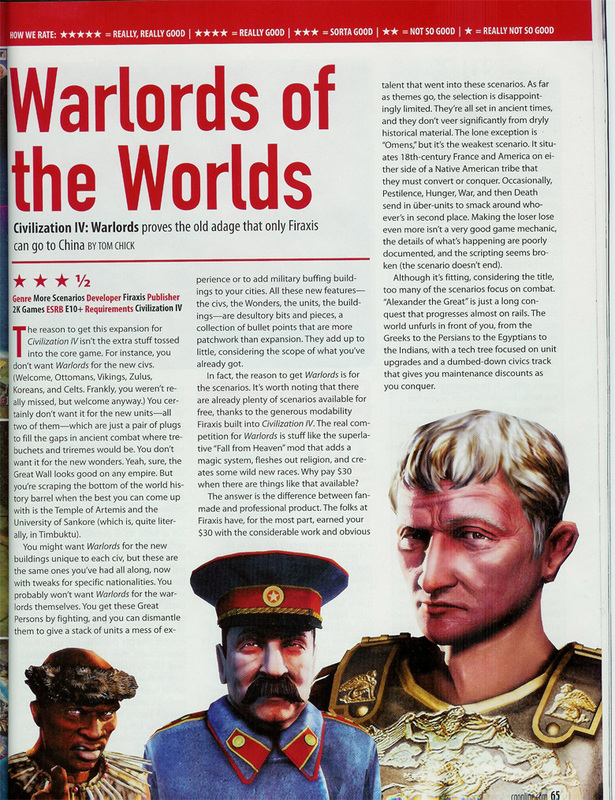 Anyway, I wouldn't bad mouth warlords or the magazine, but the difference between FfH and warlords is that Firaxis has people working on their products full time, and so have a finished product to review. Magazines and comic books usually have a date on them two months later than they are actually released. I don't remember if it's a legal or a marketing reason, though. I dont think they were insinuating that we aren't talented. Just that the main competition for Warlords were mods like ours and that warlords is still worth the cost because of the auality of the scenerios. A win-win for everyone. Actually i got the impression that they were insinuating that the warlords was NOT as good as the mods. THe scenarios are nice, but the way they said it - I got the impression that they were complementing the mod community over Firaxis? Maybe i read it wrong. It seems to give the message that the mods are better inspired, the Expansion better polished. bah! No mention of CFC in either article? Or did they assume their readers already know where to get the mods? But congrats for getting the mag mentions, Kael! Mad Max Fury Road ... post apocalytic warfare. It's hard to think they slammed FfH when their adjective of choice was "superlative". After the paragraph break I believe they do a slight gear-shift from 'the superlative FfH' to all fan-created mods in general. They say Warlords is much more polished than the fan-based stuf considdered as a whole. But yeah, for all the rave about te polish, the don't seem to excited in teh scenarios description. I guess I could find out for myself. I bought the damn thing about a week ago... haven't even opened the box yet. Oy! UgLe Forum Games: Easy to play Complex strategy Ruthless opponents No dice Skill for the for all! Just finished: They put Creatures. In our Ears! #1. Accepting substitutes: Night of the Werewolves VIII. Starts upon completion of NotW VII. Taking signups: They put Creatures. In our Ears! #2. Starts upon completion of NotW VIII. Recidivist thief of forum game concepts. I dont mind getting dinged for polish at this stage. The FfH design is ambicious and we have a long way to go before everything is done. And to be honest I dont know that we will ever be as polished as Firaxis products. I dont mean that from an art standpoint, Id put the FfH art team members against firaxis guys anyday. But from a game balance perspective. Firaxis is awesome at that and tend to prioritize balance over flavor. I tend to work from the opposite direction and try to balance out things I think are fun. An example: a big part of that is their design philosophy of patterns. Every leader has 2 traits, every civ has 1 unique building, every civ has one unique unit, etc etc. Real balance is difficult but possible in that system. But of course we follow a different methodolgy. The good part is I feel like the "no patterns" provides a lot more flavor. The bad part is... if you thought it was hard to balance two civs that have a different building and unit, try balancing one with 4 unique buildings and 1 unique unit with another with no unique buildings, 8 unique units and 4 traits. Then add the fact that some shared units are blocked to some civs and the effect of things like the sprawling and barbarian trait and your head will explode. Firaxis isn't stupid, anything we do different than them has a downside. And we will probably always be less polished from a balance perspective because of our design choices. But what we lose in balance I think we make up for in fun factor and replayability. I agree. And also, FfH doesnt have to be 100% balanced, it just have to feel balanced. And the important part is as you say the fun factor and replayability. I agree that the FFH mod favours flavour over balance.. and that is the feature that makes me play FFH over vanilla. As for firaxis prioritizing balance over anything else, i understand that they should have a equal for all principle, like for example the religions in vanilla. But there was this one article, i know i found it on civfanatics, where someone wrote about the lack of strategy in balanced games, e.g. pen, paper, scissors... its based on a 1:3 chance of applying the correct option, there is no strategy.